This page is for knitting, felting, spinning and weaving, shoe-making and anything else I think will fit here. 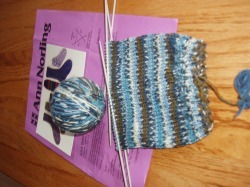 This is the beginning of my second pair of handmade socks. 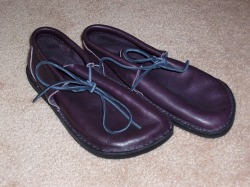 The first pair were all purple made in Boston years ago and I still wear them. 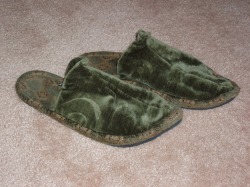 These slippers are made from upholstery fabric, industrial wool felt and Vibram soles. They are warm and durable. 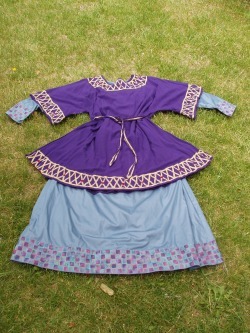 I made this hand painted costume for a theatrical production of A Lion in Winter. It was worn by King Philip of France. These are iron-age Celtic bog shoes. They are the European answer to the North American moccasin. I made them from I leather coat I picked up at the thrift store, They fit well and are really comfortable. They are a bit thin soled, so walking on rough gravel is not so good. 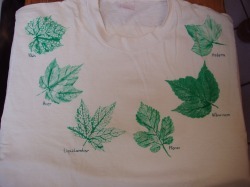 This is a shirt I made when I lived in Virginia. I sure miss the wonderful deciduous trees and forests! These are all sewn by hand. They won a first place ribbon in the New Mexico State Fair a couple years ago. These are a pair of turnshoes I made a little while back. 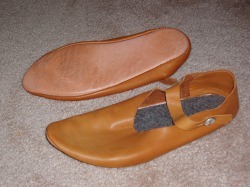 They are lined with a thick layer of wool felt and are very comfortable to wear.